I've always prided myself on having nice hair. All through my school years, my hair was long, blonde, thick, and in my opinion, one of my best features. I could wear it up or down, straight or curled, and it never gave me problems. Of course, junior high was a bit awkward because of some hair-styling follies. But I'm so thankful my mom refused to give in to my pleas for bangs — because back then, that meant your bangs were daily fried by the curling iron and puffed up to be at least half the size of your entire face. Babies, hormonal changes, and a slowing metabolism have made my hair quite a bit more difficult to deal with in recent years. So, I decided a couple of years ago that the answer to all my hair problems was obviously that I was using unnatural shampoo and conditioner, stripping all the natural oils from my scalp, and artificially caring for my hair. I convinced myself that going no ‘poo would fix my hair issues. The initial “adjustment period” of going no ‘poo was rough, classic of pretty much everyone who does it. When I got out of the shower with freshly-washed hair, it clumped together and felt like coarse straw. When it was dry, it looked like a grease pit — like I hadn’t washed it at all! It smelled really bad, too! I wore my hair in a ponytail for weeks while I waited for this adjustment period to end, and thank goodness, it finally did. Little by little, the greasiness subsided, the yucky smell dissipated, and I was able to feel somewhat normal again. As promised, no ‘poo allowed me to go three to five days between washes. It saved me all kinds of time by not having to wash, dry, and style as often, and it saved me money because — let's face it — baking soda and ACV are basically free. I stuck with my no ‘poo routine for over a year. During that time, however, my hair felt like it was getting drier and more brittle with each passing month. Every time I used a heated styling tool, I was afraid that I was damaging my hair. It was always tangled — so much so that I brushed it up to four times a day. One day, my mom asked me what was wrong with my hair. She said it looked dull and lifeless and unhealthy. Then in November 2012, we had family pictures taken. Even though many of the photos were taken at sunset when the light didn’t shine directly on my hair, I was shocked at how truly thin and unhealthy it looked. I was actually really sad about it. It didn't dawn on me for another six months that no ‘poo might have actually been damaging my hair. When it finally occurred to me that no ‘poo might not be the best option for me, I honestly didn't know what to do. I had been living the no ‘poo “lifestyle” (or whatever you want to call it) for so long that I believed using store-bought shampoo and conditioner again was wrong! That sounds ludicrous, doesn't it? I guess I thought the imaginary No ‘Poo Police were going to arrest me or something. My first attempt at transitioning out of no ‘poo was what I believed to be the next best thing: homemade shampoo. I tried recipe after recipe, and each time the result was the same. My hair remained dull, lifeless, thin, and unhealthy. The greasiness and the smell came back. I tried washing it with bentonite clay. I made detoxing hair masks. I bought DIY beauty books. I tried washing with straight water. I used aloe vera gel, coconut oil, egg whites, coconut milk, castile soap, and more. I had it trimmed every six weeks. By this time in my health journey, I was having some real issues with my metabolism and thyroid. I couldn’t figure out how to style my hair to hide how dirty it looked and was so embarrassed by it that I wore a hat almost daily. I decided that, however unnatural it was, I had to regain some sense of normalcy. So I went against my instincts, drove as fast as I could to the store, and read the ingredient lists of every shampoo on the shelf until I found one I felt somewhat okay about using. I promptly drove back home and got in the shower (for the fourth time that day) to try yet again to de-grease and de-odorize my hair. Well, it worked. That one wash removed the gunk and the smell. My hair felt soft and smooth, didn't tangle, and actually had a bit of shine. I continued going as many days as possible between washes, and my hair continued to improve. The shampoo and conditioner I bought at the store that day were not products I wanted to use on a long-term basis. I knew they had questionable ingredients. I knew they were stripping the natural oils from my scalp and artificially conditioning my hair. But at least I found something that would allow me to feel good about myself again and would buy me time while I searched for a more natural alternative. After many more products, trial periods, and some good and not-so-good results, I finally found products that work for me and meet my high, natural standards. I use and love Shea Moisture's Sea Kelp & Argan Oil Shampoo and Restorative Conditioner. The ingredients aren't perfect, but they are all listed and explained on their site. These products have a very low EWG database rating, and I love that they are free of so many of the harmful ingredients used in most commercial products. No parabens, phthalates, paraffin, formaldehyde, propylene glycol, mineral oil, synthetic fragrance or color, petrolatum, or DEA, and no animal testing. I've also tried 100% Pure's Burdock and Neem Shampoo. I use this every couple of weeks as a cleansing shampoo because I still feel like I get a bit of gunk build-up at times. I certainly don't think everyone should have two or more hair products in their showers, and as I experiment to figure out what works for me, I look forward to the day when I hone in on “the one” that works for me and my body. Many people have great success when they ditch their bottled shampoo and conditioner and go no ‘poo (like Jenny did). I, unfortunately, was not one of those people. I'm fairly certain that the metabolic issues I was experiencing at the time were causing all sorts of hormonal changes and imbalances in my body, which appeared outwardly as greasy, thinning, and brittle hair. Since beginning a nutritional balancing program over a year ago, my hair has steadily grown and thickened. I believe it is also an outward sign of the inward healing that's taking place, slowly but surely, in my body. I've even noticed that my scalp changes depending on what time of the month it is. Closer to my cycle, my scalp is more oily and even a bit itchy. I have to wash my hair every 2 to 3 days during this time. Further into the month, my scalp normalizes and I can go 4 to 5 days between washes. Again, this is my theory that my hormones are still balancing out and will eventually settle down — and make my hair more predictable. I'm also happy to report that I'm no longer having my hair professionally dyed or highlighted. 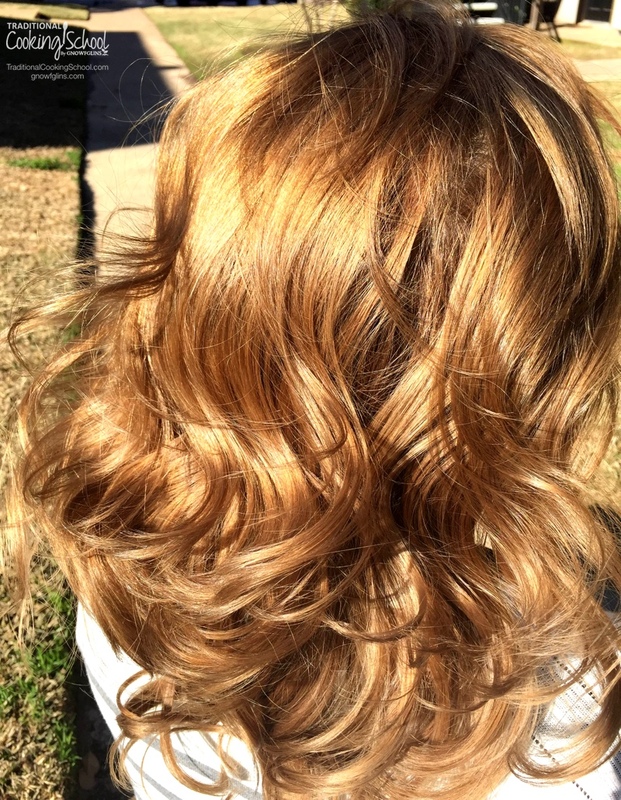 That's right — as my hair has gotten healthier, I've been able to go back to my natural color! I always thought I had dingy, dishwater blonde hair, but I actually really like the shiny, dark blonde that God gave me, and I've even noticed that I have some natural highlights! I doubt I'll ever try no ‘poo again. I just didn't like the way my hair looked, felt, or smelled. 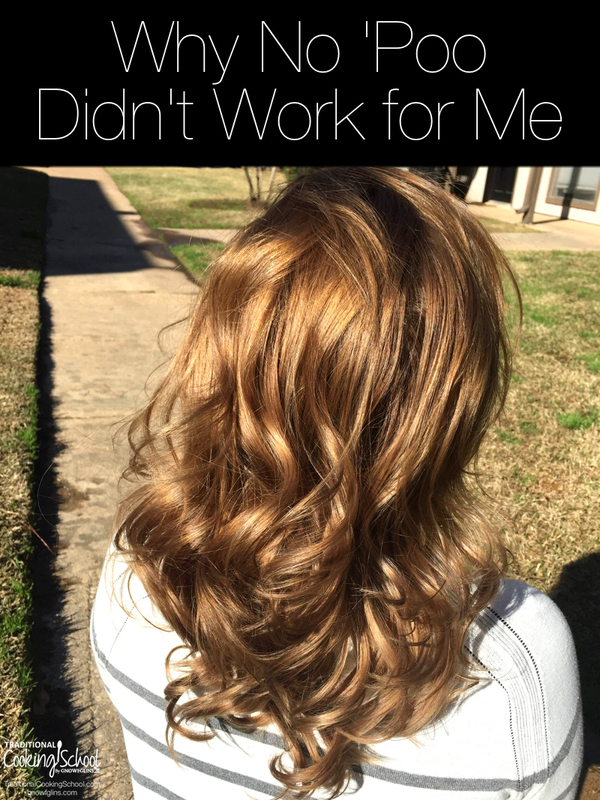 I've since read countless testimonies like mine — women who tried no ‘poo, who desperately wanted it to work, and who ended up going back to shampoo and conditioner. I don't think that makes us failures. I think it's one more example of how not everything works for everybody. There's no one-size-fits-all approach to ANYTHING. Have you gone no ‘poo? How did it work for you? By the way, I meant it when I said “not everything works for everybody” — because no ‘poo worked for Jenny and you can read about that here. I can so relate to this! As a teacher, I only had two months to make “no poo” work for me – and it failed miserably. I spent one whole summer with hair that constantly looked unwashed – and wore hats as often as I could! I had a few comments from close friends about what was going on with my hair!! I couldn’t go back to school with hair that looked like I never washed it, so that was the end of the road for me. I also bought books and tried lots of homemade shampoo recipes, but nothing worked (I have since learned that hard water might have been responsible for some of these fails). I finally found two shampoos that work for me, whose ingredients I am okay with, and use a vinegar rinse or herbal rinse as conditioner. Which shampoos did you find, Andrea? I’m always up for trying new things! So interesting about how your hormonal/metabolism changes affect the state of your hair and scalp! I’m in the last 2 weeks of pregnancy and can definitely see that happening with my hair and skin right now. Good luck with your lovely hair! Alyssa, I used that exact recipe for homemade coconut milk shampoo, and it did not work for me at all. It sure smelled amazing though! Blessings with the rest of your pregnancy and welcoming your new little one. I have a thyroid condition along with epilepsy that I take many meds for and low blood sugar, lump all those together, the no poo didn’t work for me and I am trying the coconut milk thing, but my usual full of body hair that is wavy and shiny is now dry and limp… I’m hating it. Any tips? Could you share more about the co-wash method, Jess? I have used the no-poo for over a year. My hair is not as dry as before, but I also use a lot of oils on my hands and face which also end up in my hair. My hair doesn’t fall out quit as bad, so I am happy with the results even tho’ it’s not perfect. Being over 50 probably has something to do with it as well. I use a jojoba shampoo and conditioner once or twice a month and a natural styling gel. When I heard about the no poo method, I instinctively knew it would not be a good thing for my dry hair. I bought an eBook called Live Curly, Live Free, which explains a lot of hair chemistry. The parts that explain PH are very important. Baking soda and apple cider vinegar are exponentially very far from the natural PH of hair. I am not sure what the PH is when they combine (as they are opposites, baking soda is a base and vinegar is an acid). It probably depends on the amounts of each that are used each time. Yes, I have heard that no ‘poo is not good for curly hair. It didn’t work for Wardee either, and for the same reason. My hair is not naturally curly, but I usually style it in curls the day after washing and then I don’t re-style it again until the next washing. My hair never held curl when I was no ‘poo. By the second day, my curls are flat, but then I put it in my favorite hairstyle: a messy bun! That’s wonderful that you’ve had success with no ‘poo! Tea tree oil is great for scalp issues. Thanks for stopping by all the way from Norway! I’ve tried the baking soda and water and ACV and it worked for awhile, but then my hair just started feeling “icky”. (That’s the only word I can think of to describe it) But then, I heard about using rye flour. It has pantothenic acid in it, like the commercial product Pantene. You just mix it with water until it’s runny, apply to wet hair, let it sit while you finish the rest of your shower and rinse. I have to say, I love it! I do mix a bit a baking soda in with it and I rinse with ACV. You have to be sure to rinse well, otherwise you’ll have dry flour in your hair. How interesting! I have never heard of that before, but it totally makes sense! I tried “no-poo”, but my hair became too dry & brittle. I tried various forms of coconut oil & coconut milk, but my hair was too greasy. I now use the rye-flour and water with ACV rinse. In the last batch of rye shampoo, I added a little Aloe and really like the result. I can go about 1 week between washes although occasionally in the winter I could have used more conditioning between washes. I would love to hear what others have tried for conditioning. I’m trying to make soap nuts liquid work. It doesn’t give me enough suds unless I mix a little commercial shampoo with it, about 2 Tb. for every 8 oz. of soap nuts liquid. Wish I could wean off the commercial, but I’m satisfied for now with minimizing my exposure. I use Griffin remedy, http://griffinremedy.com/product-category/shampoo/, as the soap nuts booster. The ingredients are all very natural and healthy, with possibly the exception of MSM, which is the emulsifier. At least MSM is plant-based. Griffin Remedy contains NO parabens, not sulfates, and no harmful chemicals. I haven’t tried yet, but I wonder if mixing a little liquid castille soap with the soap nuts liquid would make it perform better. Hard water in my locale is an issue, and castille soap tends to leave a residue in hard water. I did the no-poo thing for about 4 years before I noticed my hair was gradually getting less and less healthy. I was completely happy with it until then. Like you, I think it has had to do with getting older and my hormones and body chemistry changing. Last fall my hair started getting weak, brittle, lots of split ends, and just thin and lifeless. I went back to shampoo and conditioner and *boom* it got better! Right now I’m able to do a combo of no-poo and poo, which meets my needs. I no-poo for 2 washes in a row and then use my shampoo and conditioner. Hair is looking much healthier and stronger! I’m still using the first bottles of shampoo and conditioner I bought (Yes to Blueberries brand), but looking for something a bit more natural. Thanks for the recommendations! That’s great that you’ve found the right balance for you! Isn’t it funny how each of us uses something a little different, but somehow we know it when we’ve found what works?! I did the same, baking soda and ACV Rinse. Sometimes my hair would feel wonderful. Those days were really, really great days. Most days were awful though. I tend to have a drier scalp than an oily one. A friend of mine has an oily scalp and no poo with baking soda works amazing on her. She swears by it. Sooo…you just never know. Oh, I am so glad you posted this, Lindsey! I haven’t been washing my hair everyday for years now. And I have not tried the no-poo method; I read enough about it to have a “hunch” it wasn’t right for me. Instead I just switched shampoos (stuff I can get through Swanson Vitamins), but still not liking the way my hair has been looking. I think it has to do, too, with hormones and such (maybe gut health?!?). I finally broke down & went to my local beauty supply and had the gal help me pick something out, told her my criteria (mostly, no parabens). The shampoo I got does have sulfates, boo-hoo, but also has olive oil. Between it & the new conditioner, I can tell a difference (not as dry, but does get “greasy” faster). I’m also trying to not blow dry my hair these days & let the natural curls stick around (it’s challenging to style between shampoos, however). Probably doesn’t help that I color it. Just not ready to give that up, though. 🙂 Thanks for sharing! I’m so glad you found this helpful and know that you’re not alone! 😉 Just FYI, I really like a natural hair color that you can buy at pretty much any health food store, Amazon, or Vitacost called Naturtint. It’s not perfectly natural, but it is so much better than what a salon uses or the regular boxed hair color. I used that when I was transitioning my hair color from professionally colored and highlighted to my natural color. It really made the process easier! Hope you find that perfect one product for your hair! Thanks for sharing your products, Emilie! The shampoo I use doesn’t really lather. It gets a little bit of foam, but it definitely isn’t super bubbly or lathering, and the little bit of foam is gone in a few seconds. Does that help? I really appreciate this post. I’ve been having so many issues with my scalp and eyebrows (peeling, sores, redness, itching) since I went away from using “supermarket shampoo”. I think something is going on internally but unsure as I haven’t received any sensible medical advice so far! Ive used Shea moisture curl cream before and really liked that! I’ll have to look more into the shampoo. Thanks! I have not tried the no-poo method simply because I “watched” a group of friends who did and for them, it didn’t work either. I have had problems with my hair in the past few years but I think that it has perhaps been the change in our water (??) when we moved out to a rural area, than it has hormonal issues ~ although the latter is certainly possible. I have not yet found a natural shampoo that works so I’ll definitely be looking in to those that you’ve recommended. What I have done is to use a conventional shampoo as natural as I can get, and then use coconut oil combined with essential oils to help manage the frizz. It works…..sort of. 🙁 We’ll just keep looking until we find something that really does. Maybe it is your water, Jenny. I noticed a big change in the softness of my hair (even long after quitting no ‘poo) when we installed a chlorine filter on our shower. So, last October I started using Dr Christopher’s Pure Botanical BF&C Shampoo & Conditioner. The ingredients are pretty good (and it doesn’t lather either, foams like you were saying). My hair feels and looks so much better now (and I have a shine back!!). And, I can still usually go 4 days between shampooing!! I read enough about no poo to never try it! I went straight for Morrocco Method and have had some pretty good success. However, I am a stay at home Mom and can’t spend 30 bucks on a bottle of shampoo. So far I’ve had great results from a “tea” made of three cups water and 6 soap nuts. Then I make a conditioner of ACV, coconut milk, aloe gel and vegetable glycerine. My curls are more defined than ever and frizz is almost non existent! I tried the no poo for a year but it just wasn’t working. Went back to conventional shampoo but didn’t love it. Son a whim I tried just water and a religious use of a boar bristle brush. I “wash” ever few days, but brush every day, at least twice for 5-10 minutes at least. My hair feels great, no more frizz, it’s thick, not greasy and no smell unless I use some EOs. Just a great experience!! As a Naturopath, I only use natural cleansers in general so it has been disappointing to search for a quality organic shampoo. Desert Essence was one of my faves or Aveda of course, but still not quite right. Melaleuca Naturals was my fave for awhile but isn’t all great. My only choice now is WEN. It is truly different than any other product and superior to any wannabes… There is no comparison. The cheapest way to buy it is on QVC.com, they have 2 packs for $40 with $3 shipping. That is the best deal I have found. By the way, my daughter is biracial and WEN is the only way for her to have soft beautiful hair. I recommend WEN to anyone, as they have various formulas based in soy, wheat, honey or rice so even different allergies can be avoided. I wish I could sell it! WEN is not natural at all. Its full of silicones and other chemicals. You should definitely look at the ingredients! Your story sounds exactly like mine. Except that my hair was fabulous the first few months after the ajustment period. But then I started noticing that I had a lot of short fuzzy hairs on the top of my head. I finally realized that my hair was breaking off. I immediately started researching home made shampoos. And just like you I also did the Dr.Bronners Castile soap/coconut milk shampoo and so many more. I have and still am as of right now using bentonite clay and a hair tea/ACV rinse. It too worked well for a short time but my hair is again a total grease pit. I used to put EO’s in my rinse but had to stop because my scalp is very oily. I finally caved and ordered a sampler pack of the Moroccan Method shampoo’s and conditioners. It is very expensive and I really hope that it will be worth it. I want to do what I can to not go back to conventional shampoos. It’s been almost 2 years and other than my greasy scalp my hair is soft, think and beautiful. I must conquer the oily/dandruffy scalp!!! I understand your frustrations! You’ll have to let us know how Morocco Method works for you! I’m glad that I came across this post. Just this week, I decided that I had to give up using my homemade shampoo bar and ac vinegar rinse. After 3 years of using it, it just wasn’t working for me any more. Constantly itchy scalp and build up in my hair that just wouldn’t go away. I was really feeling like a failure even though no one else I know has even tried to make their own shampoo. I’m trying out a shampoo called Millcreek Botanicals. It says that it’s ph balanced, sulfate free and paraben free. Here’s hoping…. I finally found a conventional shampoo that works for me(Dove intensive repair) and I love our so much I can’t give it up and risk something new lol but I only wash my hair every other day and once a week I do an ACV/EO rinse on an off day. It works great for me, so I’m sticking with it until I get my diet cleaned up lol, then I’ll take a chance on changing my shampoo. Have you tried Arbonne.. i have been using their hair products for 10 yrs.. The company’s basis is “Pure, Safe, Beneficial” for all their products.. they are Vegan and no animal cruelty company.. and follow EU standards which as you know are MUCH better than US.. They have a shampoo with tea tree oil in it.. and in the past few years have come out with a new line that is really fabulous.. Pure Vibrance.. I use the shampoo, conditioner and texturizing mouse from Pure Vibrance.. i have short hair.. i have heard from the Long haired people that they LOVE the hair masque and serun.. Feel free to contact me if you want to purchase.. i can hook you up with my person.. then you can purchase on your own thru your own customer acct online…. Thanks for the review.. it is always helpful to know that some of these natural methods just don’t produce the same effect for everyone. Arbonne is not all natural and the company is horrid to deal with when you try and return stuff. They do a lot of green washing… I am glad that you have found it works for you but try and read what is actually in their products without all the ads… I use Morocco Method and haven’t looked back! I had the same experience with no ‘poo! Now I just shampoo every 3-5 days, depending on the season and the health of my hair. My hair is much thicker, shinier, and more manageable than it has ever been. Yes I had initial success but now for over a year of use then a year since stopping I have not found anything that helps my hair grow back. It is getting thinner and not growing. So I am interested in the other things you did as well as the shampoo, please. I have thin straight hair and, at 55, I assume some hormonal issues. I tried no poo for a few months and it was a disaster, much like your experience. For the last 2 months I have been trying co-washing and it has worked out much better. I take about 16 oz. of a conditioner I like, Mane ‘N Tail, (the only one I’ve tried this with so far) added some EOs like a few drops of Tea Tree, Lemon Eucalyptus, Lavender and Peppermint. They say this is good for curly, dry hair but so far I’ve liked it for mine. I could co-wash every 3rd or 4th day at first and had to more often as time went on, but they say to wash once every 4-6 weeks with shampoo to get any build up off. Since I get my hair cut every 6-8 weeks, I just decided to get a shampoo at the hair cutters to make it easy. It has worked so far. I use my concoction, scrub to the roots, leave on for a few minutes and rinse well. Today is the first day I decided to add a little conditioner after this to help my ends and rinse. Works much better than no poo and no bad stuff on my head. It has given it a little more body. Hope this gives others some hope. No ‘poo didn’t work for me either. My hair got super dry and brittle. It still looked greasy no matter how often I washed it. I lasted 11 months. I tried the no-poo/acv for almost a year before giving up. I refused to go back to regular shampoos; none of the recipes I found on line worked out or were too troublesome. Finally found the solution……….homemade hair soap! I buy locally or on line and then use acv to rinse. I even create herbal acv rinses using rosemary, nettle, mint and even black walnut powder (it gives my hair a little color, but – sshh – don’t tell). I LOVE Shea Moisture products! I used the Moisture Retention formula first, but the one that works best for my hair is Superfruit Complex 10-in-1 Renewal System shampoo and conditioner. Leaves my hair feeling soft and it smells wonderful! After a serious illness I lost most of my hair and ended up cutting to about an inch in length. I found a recipe for a hair renewal oil and started using that and only washing with water. I think with such short hair it was an easy transition to stop using shampoo & conditioner. It’s been a year and all the bald spots have filled in nice and thick. I no longer use the hair oil and still just wash with water. I have naturally curly hair and it used to be so dry all the time. Since going with just water washing I have not had any issues and can go 5 – 7 days without doing much to my hair. I will say that bed head can be interesting, but wet hands run through the hair and I’m done. I have also attempted no poo but couldn’t get through the initial greasy stage. Instead I use shikakai. This is an Indian herb you buy as a powder and make into a paste. Completely natural and you get results like shampoo 🙂 There’s lots of information about preparing and using it on the net. I found a company called Chagrin Valley Soap and Salve who makes FABULOUS truly natural products. They are a small family run company too, which I like to support. Their shampoo bars work great for me, I have fine hair and it now has so much body! I use an ACV rinse each time I shampoo. It took me a while to find the right ratio of water to ACV for the rinse, but now that I have, it’s great! I highly recommend their products, everything I’ve tried has been great. I use baking soda and homemade blueberry vinegar. It looks blue in the bottle but red when it hits my hair and I pretend (no evidence!) that it adds a bit of a red shine to my hair. 😀 Another side affect I’ve found – I can wash my long hair using 4-6 cups of water with no ‘poo but it takes a LOT of water to wash out shampoo and conditioner. Since we’re off-grid and on a shallow well, that’s important. I had the very same experience! I started using no poo methods because I got a very severe contact eczema after working ina cosmetics store (I’m not going to name it) where my sking was constantly in contact with cosmetic ingredients. After that nothing seemed to work as I got a bad rash every time I used normal shampoo, so I switched ans started using first natural cosmetics (it wasn’t that a big change as I already sued partly natural shampoos) then later shampoo bars and castile soaps etc. It got better and my hair even started growing much faster, but after a while, well after the transiition period was over it also got dull, the acidic rinse was also not good to my sking, if the shampoo soaps contained way too many essentials oils I got rashes again (and strangely I’m not allergic to essential oils normally at all!) so in the end I stopped. Right now what works for me is and I’m satisfied with it, that I use an ultrasensitive baby shampoo which is free of sulfates, parabens, everything harmful basically, and most importantly parfums! It cleans perfectly and as it doesn’t really have a smell I usually mix it with some good quality honey, or sometimes I do herbal tea rinse after it. It’s really the best imo. I have never tried “no poo” but have been using “Dirty Poo” by Primal Life Organics for over 1 1/2 years. It is made of dirt, clay, sea kelp. I rinse with diluted acv. I’m pleased with my hair most of the time…there are a few things I need to figure out that would make it even better. The best part is I know without a doubt my hair is healthier. I recently got it cut but had it very long and only had trims once every 6-7 months and I had almost no split ends! My stylist as been amazed. I used to have really bad split ends! I switched everything in my house to more “healthy” options about a year ago. Hair care and deodorant were the absolute worst. Everything else has been relatively simple to replace. I tried baking soda and apple cider vinager. I made it less than a week with matted hair and flaking painful scalp and dry “hay” hair. Detox period? Maybe. But I knew of too many people who’s hair was ruined by this and I didn’t want to risk it. I tried diluted Dr Bronners soap. It did make my hair clean but again, very dry, and my scalp flaked so bad — and detangling? Give me a break. Heck no. I tried Dr Bronners with coconut oil. I tried water only. I tried Andalou Naturals shampoo from whole foods. Acure Organics shampoos (also whole foods). These were ok but my hair was still dry and lifeless and oh so hard to brush. I did not try making my own shampoo with soap nuts but mostly because I don’t like personal care DIY’s with fast expiration dates. Personal preference. I had been eyeing Morrocco Method for MONTHS but couldn’t bring myself the money. In October I finally forked over the cash for all of the travel sizes for my husband and I to try and we will never switch. Both of us have sensitive scalps, I have extremely dry hair, his is blond and oily. Both of us have strait hair so the grease is super noticeable. Yes, it’s expensive. But it’s worth it because I don’t have to style it, my husband washes his hair twice a week (I’m still every other day, I think it is the longer hair), and I don’t pay for hair appointments at a salon anymore. Those costs being cut out are HUGE and allow me to spend a little more on a good shampoo. I now cut my own hair using the recommendations on their sight for lunar cutting. Doing so has made my hair grow faster and my husbands receding hairline is growing back. I don’t have to use styling products anymore because this stuff just brings out the best in my hair. My hair naturally rests where I wanted it to for years and had to blow dry upside down with root lifter to achieve. I had pancake hair. I’ve never had people tell me my hair looks nice (unless I had just left a salon, no joke), but I get compliments on a regular basis on my color and how it looks. I alternate 2 of the shampoos (ACV and Sea) and my husband uses 3 (ACV, Earth, and Pine Shale). I would seriously recommend the travel sizes to get an idea of what you like before buying full bottles because I ended up loving both that I didn’t think I would and HATING one I was sure I would like. I would also say to dilute as much as you can and just keep scrubbing your hair and adding shampoo if necessary until your hair “feels” clean. I’ve never had the sensation of feeling a clean head and scalp until using this shampoo but when you figure out the amount to use and how much to scrub, you’ll know. Sometimes I want to switch to a more bubbly shampoo (and my product junkie self loves the idea of trying new things), but Morrocco Method has a great system and after how much it has helped my husband and I, I can’t bring myself to switch. I apologize for the errors throughout that message. Sometimes writing long comments on a cell phone isn’t the smartest decision for me. I’ve tried 2 or 3 times, and it’s never worked for me either. I have naturally oily hair, and no poo just made it greasier and greasier. I never even could get through the detox period- I don’t think there would have been any improvement anyway. I also have hormonal issues that are causing thinning greasy hair, so I am currently using a clarifying shampoo that I think works ok and doesn’t have horrible ingredients. I am looking forward to balancing my hormones and improving my hair growth. Can you tell me more about the nutritional balancing program you are going through? My hormones are in desperate need of something similar. This is for ladies with naturally curly hair, whether African American or Caucasian (I’m AA). The no-poo method will not work for that. Our hair is strong but sensitive and so are our scalps. I had an issue with my sensitive skin and went to my dermatologist. She did a biopsy and found that I was allergic to every chemical used in beauty products. No parabens, no SLS, no preservatives, no propylene glycol. For years, I made my own cosmetics until companies like Eminence and Body Deli started making organic stuff. What a relief! My hair is in locs now and I co-wash it with a natural conditioner, Urtekram Organic Aloe Vera Conditioner. Co-washing is using conditioner rather than shampoo to wash hair since conditioner has cleansing agents in it. It works very well for my hair. Also, people don’t know this (well, actually, AA people have know it for years) but the curlier one’s hair is, the less they have to wash it. I have Caucasian friends with naturally curly hair. I have hooked them up with AA combs and the co-washing once a week… they love it and their hair is no longer frizzy or weird. With naturally curly hair, it takes the natural oils a lot longer to travel down the hair shaft. That’s also why our hair isn’t shiny. Light doesn’t hit it like straight hair so stop trying to get it to shine with fake stuff. I use a growth oil I have made from Jamaican Black Castor oil, argan oil, saw palmetto-infused oil and rosemary eo. I do a hot-oil treatment with a cap every week to keep my locs nice, supple and gorgeous. I tried this method on my Caucasian BFF with naturally curly hair and she loves it. She now does this as part of her hair routine. Also have a Chlorine filter on my showerhead. These are NOT EXPENSIVE and if you are on city water, it will make a big difference for your whole skin! If you are on well water…be sure to test it for the toxins now being found in ground water such as Arsenic, Pesticides, Jet Fuel, etc. Can’t be too healthy on our skin….nor for ingesting! Good Luck with all our journeys in this toxic world! I had horrible greasy, stinky hair, but found a solution. I use plain old white flour to wash my hair and it works wonders. I just dissolve about 2, 3tbls of flour in a gallon of warm water and rub it into my scalp and hair and then rinse. Next, I rinse my hair by adding 2, 3 drops of vinegar to a gallon of warm water and then rinse my hair again with water to get out the vinegar smell. How many methods of no-pooing did you try before giving up? All you wrote about were your results. Your hair looks similar to mine and I am considering trying this, so it would be good to know what to avoid! Try egg yolks! I’ve been doing it for two years now. Arbonne has some really great shampoo! I know us said you’d never try no poo again, but if you ever want to give something a try I’d suggest egg yolks. Not the whites. I’ve been using it for two years and it pulls out the oils just fine, keeps your hair pH balanced, and conditions. Dr. Natasha from the GAPS diet also mentioned amusing egg yolks in a WAPF convention we went to in Ireland. Still, don’t feel bad about it not working. I hated what baking soda and ACV did to my hair. I am about to try a mix of shikakai 10g soapnut 10g and amla 5g which I found on hairbudda.net she calls it ree-shi I plan on trying it differently though by making a paste out of powder and boiling water a day ahead. I hope it works it was the fact the there is no oil to stick to the hair that might mke it work in a hard water area. Anyway the website has lots of different recipes for natural hair things you might all be interested in. 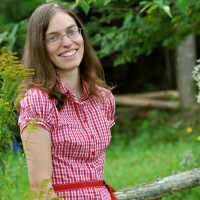 I also found chagrinvalleysoapandsalve.com very informative. Two words: Aubrey Organics. Aubrey has a shampoo for you, and if necessary, a conditioner too, and every single one of their formulas is basically edible – no ingredients to feel iffy about. Aubrey himself, unfortunately, is no longer with us, but he was a clean ingredients zealot who also figured out how to deliver the results we all want, across our various hair types and lifestyle demands. I’ve been using Aubrey’s Blue Chamomile conditioning shampoo for 25 years and at 55 years of age have shiny healthy (and somewhat long) hair that’s my original color, no treatment needed. I never bought into the no shampoo fad, though I understand from the struggles I had before finding Aubrey why people might be desperate enough to give it a try. in my no poo journey I started just using shampoo less and less then went to more natural shampoos and organic ones I tried the generic form of wen you know the one you see on infomercials because it was way cheaper hair one at sallys beauty supply but the no lathering and following the directions meant it was $2 every time I washed my hair which I had got down to once a week I tried clay powder and I tried the baking soda and vinegar got to say no baking soda and vinegar is not super cheap because you have to use more than you would of shampoo a normal bottle of sauve would last 6 months sometimes and cost a dollar or two and no way I could make the baking soda and vinegar last that long and oh my goodness it was so difficult to apply. in my investigation I came accrossed a youtuber who was getting her boyfriend to go no poo but he had super greasy hair so they decided to go one month of nothing but water to reset his oils to a more normal level I decided I could totally do this and I wanted a break anyways I got a boars hair hair brush to even out the oils. and just started washing with water when I bathed after the first week about when my hair would normally need washed it started to get oily but i was like I can totally wait it out for another three weeks but after the second week my hair was normal again. granted I used the boars hair brush a lot at that time but after that month was over I just kept on going sometimes my hair got oily and I would use cocoanut oil but if I used to much my hair would be greasy and smell funny and I would have to use something to was the cocoanut oil out I think I used baby shampoo or something maybe it was the organic shampoo not sure water does not remove yuck or stuck on stink but for me it works well at removing dust dirt and a natrual amount of hair oil I do find that if I don’t agitate my scalp basicly doing the scrubbing type thing I would do with shampoo I will get dangeroff but I have had success at no poo and having “next day hair” for the last 4 years. I had always hated the fly away light hair that I would get the day of washing my hair and loved it the next day but then the next day it would be too greasy I could never have happy hair my hair is totally not perfect but I love not having to think about shampoo especially with a cobathing with a toddler I switched to reusables for my cycle and cut out all switched all skin care products to cocoanut oil and it is just so nice to have so much less clutter in the bathroom and no trash. Thanks so much for sharing your story! We’re all unique, for sure! So many people on this thread seem to have given up hope for no-poo after baking soda and ACV didn’t work. I tried the baking soda/ACV method too, in high school, and it never worked for me. I have naturally fine, curly hair and it’s SO hard to find a commercial shampoo that works for me. If you have curly hair, read Curly Girl by Lorraine Hanson! She explains that many of the harmful ingredients no-poo was created to avoid are exactly those that damage curly hair. So I went to a co-wash called Renpure for a while and loved it, but got worried about the few gross ingredients even a nice natural brand still had. Now I wash my hair with rye flour every other day and follow with a lemon juice rinse and it works beautifully! You can also use an egg wash, but no more frequently than every 2 weeks to 1 month, because the protein will damage your hair if you use too much of it! The thing about no-poo is that pH is SO SO important and so many people think that no-poo is JUST baking soda and vinegar. There are so many options though! Rye flour and egg both have acidic pHs, so they’re perfect for balancing. A few people have said they have tried and like the Morrocco Method products but beware, my daughter loved it at first and then after about 2 years started to have serious problems. Her hair was falling out like crazy and breaking and her scalp got really itchy and flaky. It was no longer shiny. She was not heat styling or using any product either. She stuck with it for awhile but then in desperation she switched to a pretty healthy shampoo (Prairie Naturals) and had relief from the itching right away. She basically had to grow out new hair but it is shiny and healthy now. Just thought I’d pass that along. I always used some homemade blend of herbs as a shampoo until i went to collage. I had naturaly wavy and good hair. But after my daughters birth i started suffering from hair fall and dandruff. I used most of the shampoos available in market. Body shop ginger shampoo is the only one worked for my dandruff. But again i thought they have SLS n other ingredients so switched to MM shampoo. Initially it was working very well on my hair (1month was detox) i have been using it for 5-6 months now. And i dont see any improvement. I dont knw what exactly happened or where i went wrong but my dandruff increased instead of subsiding. Now i have very dry and horrible dandruff i never had in my life before. I used same shampoo on my 4 year old (she has straight silky and thick hair) too and her scalp is also dry now. So basically it dint work for me neighter for my daughter. I dont have much time experimenting and cant risk my already damaged hair so straight away i will be getting body shop shampoo agin to treat my dandruff first and then can think of alternate and safe brands. I am so glad you found an alternative solution to chemical shampoo. I also tried many organic shampoos 10 yrs ago and didn’t really notice a difference except in my bank account since they are so expensive. Then 5 years ago I tried the no poo thing, using baking soda every once in a while and I believe that is what made my hair brittle, dry and thinner after a couple months. I went back to shampoo but washed only half the time as before. There are so many recipes and new info and support now for different ways of going no poo that I began again about 4 weeks ago and this time No Baking Soda!? I can’t tell you how amazing my hair feels and the difference in strength, manageability and softness. The first 2 weeks were a greasy mess but suddenly this week I feel like I’m in a hair commercial.? I am feeling like I really want to stick with it but to also have some wonderful smelling alternative cleaning products when I have a date or event. I hope you post more hair care or other beauty recipes. Thanks for posting your journey. ?